The rationale of using bovine papillomavirus-1 (BPV-1) derived vectors in gene therapy protocols lies in their episomal maintenance at intermediate to high copy number, and stable, high-level expression of the gene products. We constructed the BPV-1 based vector harbouring the human low-density lipoprotein receptor (LDLR) gene cDNA and tested its ability to restore the function of the LDLR in the receptor-deficient cell line CHO-ldlA7. The introduced vector p3.7LDL produced functionally active LDL receptors in the receptor-deficient cell line CHO-ldlA7 during the 32-week period of observation as determined by the internalisation assay with the labelled LDL particles. Bovine papillomavirus type-1 (BPV-1)-derived vectors could be suitable for gene therapy due to their episomal maintenance at intermediate to high copy number and stable, high-level expression of the gene products. The constructed BPV-1 based vector p3.7LDL produced functionally active LDL receptors in the LDLR-deficient cell line CHO-ldlA7 during the 32-week period of observation. In vivo experiments should reveal, whether 1–5% transfection efficiency obtained in the current work is sufficient to bring about detectable and clinically significant lowering of the amount of circulating LDL cholesterol particles. The low-density lipoprotein receptor (LDLR) is an integral membrane glycoprotein that specifically binds LDL particles and mediates cholesterol homeostasis through receptor-mediated endocytosis. Mutations in the LDLR gene give rise to an inherited autosomal disease familial hypercholesterolemia (FH). The incidence of the homozygous form of FH is 1:106, whereas the heterozygous form affects 1 in 500 individuals . Correction of homozygous FH is possible in several ways including liver transplantation , LDL apheresis  and plasmapheresis . These treatments are laborious and in the case of liver transplantation contain several risks. Hepatocytes naturally express LDLR protein at a high level and thus are the most promising target for the LDLR gene transfer. Ex vivo and in vivo approaches have been used in liver-directed gene therapy. The ex vivo method was used in the first human LDLR gene therapy trial . The in vivo introduction of the normal LDLR gene into receptor-deficient cells should potentially result in clinically beneficial effects using less invasive procedures. Several protocols for liver-directed gene transfer have been used, e.g., those based on retrovirus , adenovirus [7–9] and adeno-associated virus (AAV) . Retroviral vectors have widely been used in ex vivo gene therapy protocols to correct liver diseases, whereas in vivo gene therapy has been achieved after the liver cells have been stimulated to regenerate. One major limitation to the usage of retroviral vectors is their inability to infect non-dividing cells . Recombinant adenoviruses can infect non-dividing cells with high efficiency and are rapidly concentrated in the liver after systemic administration. However, there are obstacles to the clinical application of these vectors as they have limited life span within the cell, and host antiviral immune response reduces the duration of vector persistence and precludes long-term transgene expression by repeated injection of the vector . AAV is another popular vector, but the low titre of pure virus preparation is the major hurdle for its broader application . The rationale of using the BPV-1-derived vectors in gene therapy protocols lies in their episomal maintenance at intermediate to high copy number and stable, high-level expression of the gene products. It has been shown that transforming proteins E5, E6 and E7 are not required whereas E1 and E2 are essential and sufficient for BPV-1 replication . Ohe et al. have demonstrated that a BPV-1-based expression vector B45-Neo containing only E1, E2, a replication origin and an upstream regulatory region (URR). They have demonstrated that episomal maintenance is retained in this vector and that cDNA expression is comparable to that of the parent construct that also contained the transforming genes. The transforming activity of BPV-1 for NIH-3T3 and C127 cells was ablated in the vector, presumably through elimination of E5, E6, and E7. The expression of cloned gene products in B45-Neo was maintained at high level for prolonged periods of time even without selective pressure. In the current study we have constructed a BPV-1 based vector harbouring the human low-density lipoprotein receptor (hLDLR) cDNA. We demonstrate expression of the hLDLR gene and functionality of its protein product, LDL receptor in the LDLR-deficient cell line CHO-ldlA7. A recombinant BPV-1 based vector (Fig. 1) containing the human low-density lipoprotein receptor (hLDLR) 2.6 kb cDNA fragment under the transcriptional control of the RSV long terminal repeat (LTR) promoter was constructed. The vector also contains the BPV-1 genes E1, E2, the replication origin and an upstream regulatory region (URR), all required for essential and sufficient replication of BPV-1 (14). The transforming genes E5, E6 and E7 were deleted. The construct was named p3.7LDL. p3.7LDL – a bovine papillomavirus-1 (BPV-1) derived vector harbouring the 2.6 kb hLDLR cDNA fragment. First, the ability of the constructed vector to replicate in the CHO cell line was tested. Moderate levels of replication were detected in the transient replication assay (Fig. 2). Further, the CHO cells that carry a defect in their endogenous LDLR gene (CHO-ldlA7)  were transfected with the vector. Absence of the hLDLR cDNA sequences in the native CHOldlA7 genome and presence of the p3.7LDL after transfection into CHO-ldlA7 cells was verified by PCR (data not shown) and Southern blot analysis (Fig. 3). In all five transfected clones analysed, the transcript from the introduced LDLR gene was detected by RT-PCR (Fig. 5) whereas there was no detectable LDLR RNA in the native CHO-ldlA7 cells. 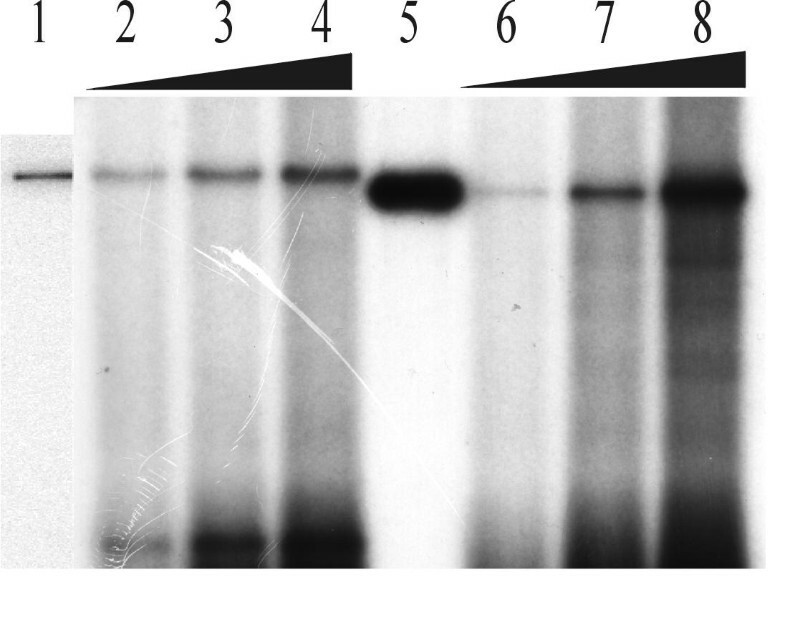 The same results were obtained with the Northern blot analysis (data not shown). We observed that apart from the episomal maintenance, the vector had probably also integrated into the host cell genome, judged by multiple bands on the Southern blot. On the other hand, the multiple bands could also reflect concatemerisation of the vector. It has been documented clearly that papillomavirus episomes tend to form episomal concatemers during the long term maintenance (24). On the gels such long concatemers may co-migrate with the chromosomal DNA and leave impression of integrated plasmid DNA. Transient replicative properties of the expression vectors. CHO cells were electroporated with 1, 2 and 5 μg of p3.7LDL (lanes 2,3,4) and the empty self-replicating vector TK3.7 (lanes 6, 7 8). Low-molecular weight DNA was digested with DpnI and the linearising enzyme Bpu1102I. Fragments were analysed by Southern blotting. The corresponding marker DNAs (200 pg each) were digested with Bpu1102I (lanes 1 and 5). Hybridisation probe was a 1 kb BPV-1 origin fragment. Exposure 12 hrs. The Southern blot analysis of native and the p3.7LDL-transfected CHO-ldlA7 cell clones. Lanes 1 to 5 – Bpu1102 digested genomic DNA from different transfected cell clones; lane 6-Bpu1102 digested genomic DNA from native CHO-ldlA7 cells; lane 7-positive control-the Bpu 1102 linearised p3.7LDL, which gives rise to a 19.3 kb band. The same linearised vector was used as a hybridisation probe. Multiple bands in transfected clones suggest integration of the vector sequences into the host cell genome. RT-PCR analysis of the native and the p3.7LDL-transfected CHO-ldlA7 cell clones. Lanes 1 to 5 – RT-PCR products from different transfected cell clones; lane 6 – native CHO-ldlA7 cells; lane 7 – negative control for cDNA synthesis (without RNA); lane 8 – negative control for PCR (reaction without cDNA); lane 9–100 bp DNA ladder (Fermentas). Integration of the p3.7LDL sequences was further confirmed by FISH (Fig. 4a). The sequence of the expression vector integrated into the genome gives cross-hybridisation signals represented by yellow double dots on the metaphase chromosomes. The speckled appearance of the vector signal indicates the episomal maintenance of the introduced vector. No such signals were observed in the FISH analysis of native CHO-ldlA7 cells (Fig. 4b). The possibility of integration of the BPV-1 based vectors in some cell lines has been also demonstrated by Ohe et al. . However, the mechanism of integration has not been clearly defined yet. Next, we looked for presence of the LDLR protein in transfected receptor-deficient cells by immunofluorescence assay (Fig. 6). The protein-specific fluorescent signal was present in 1–5% of the examined cells, localising mainly in the Golgi complex area, where post-translational processing of the protein occurs; the signal was also observed to be evenly associated with the cell membrane (Fig. 6a) while native CHO-ldlA7 cells displayed only faint background fluorescent signal (Fig. 6b). To determine the functional properties of the transgene LDLR we studied its ability to internalise LDL particles. The DiI-labeled LDL particles were added into the culture medium of transfected and native CHO-ldlA7 cells. After three hours of incubation and fixation, the transfected cells displayed a strong signal inside the cell, attributable to the internalisation of the labelled particles (Fig. 7). Figure 4a. Fluorescence in situ analysis of the p3.7LDL-transfected CHO-ldlA7 cells. The probe, generated from the p3.7LDL gives cross-hybridisation signals represented by yellow double dots on chromosomes stained with propidium iodide. This can be explained by integration of the vector sequences into the host cell genome The discrete yellow dots dispersed all over the chromosomes also correspond to plasmid-specific signals and suggest the presence of an episomal vector. Figure 4b. Fluorescence in situ analysis of the native CHO-ldlA7 cells (negative control). Assessment of the LDL receptor functionality by the internalisation assay. 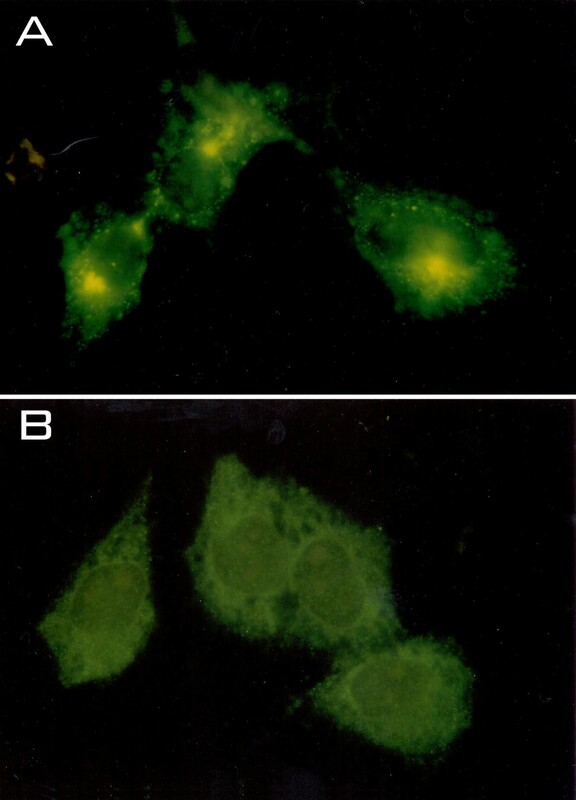 The p3.7LDL-transfected (A) and the native (B) CHOldlA7 cells were incubated with DiI-LDL particles and after fixation viewed by fluorescence microscopy. 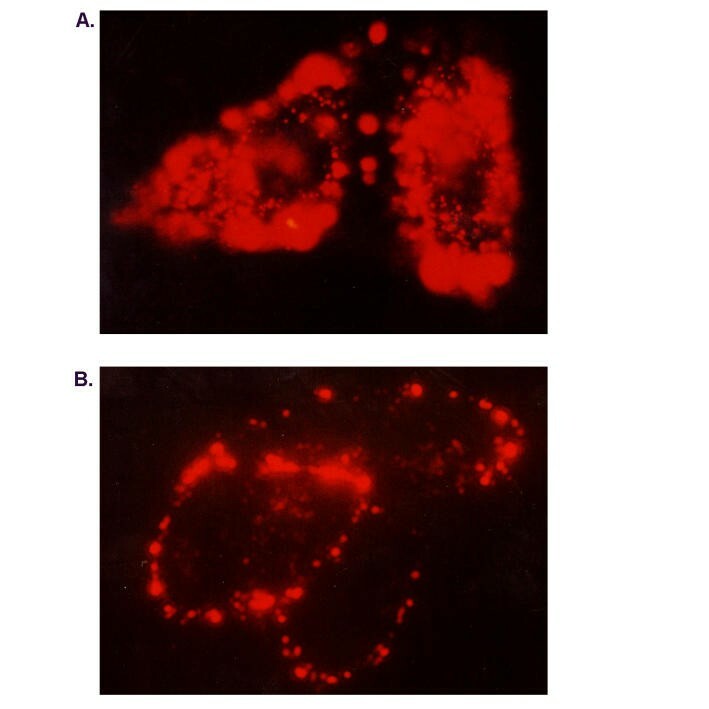 Signal from the particles (seen as red spots) is visible inside the transfected cells. Some non-transfected cells have labelled particles associated with cell membranes. Several vector systems for treatment of the LDLR defect have been used to date, but all of them have their limits. Adenoviral vectors have been used in receptor-deficient animal models for transduction of the LDLR cDNA into the liver [9, 19]. In the trials to reduce plasma LDL level in receptor-deficient (Watanabe) rabbits via recombinant adenovirus vector-mediated gene transfer, the LDL-lowering effect lasted for 4–6 days . The transient nature of reduction of plasma LDL concentrations is due to the immune response mounted against the recombinant adenoviral vector. The LDLR deficient mice give both humoral and cellular immune responses specific for the therapeutic transgene product [20, 21]. Retrovirus vectors have also been used to target the LDLR gene to liver cells in mice. Since less than 0.2% of the hepatocytes in normal conditions are in the replication cycle and retroviruses can infect proliferating cells only, hepatocyte proliferation needs to be stimulated either by partial liver resection alone, or in combination with thymidine kinase/gancyclovir treatment . The need for repeated retrovirus injections via portal vein catheter and obvious hazard of permanent liver damage sets limits to the usage of this type of vector in humans. Bovine papillomavirus type-1 (BPV-1)-derived vectors could be suitable for gene therapy due to their episomal maintenance at intermediate to high copy number and stable, high-level expression of gene products. The transforming proteins E5, E6 and E7 are not required while E1 and E2 are essential and sufficient for the BPV-1 replication . It has been noticed that human papillomavirus E1 and E2 proteins have very low immunogenicity , which may allow repeated introduction of the papilloma virus-based vectors containing therapeutic genes into individuals. Of course, it can not be ruled out that the viral sequences present in the vector elicit immune response in vivo in humans, however in the DNA vaccination experiments where E2 expression cassette was used in the plasmid, we were unable to detect any induction of antibodies against the BPV1 E2 protein in mice (DNA was delivered intramuscularly by needle injection or by Gene Gun delivery of DNA-coated gold particles). Induction of humoral response against the E1 protein has been complicated, because expression of E1 is taking place at too low a level. It might be perfectly possible that immune response is subdued due to the low level of E1. Induction of cellular immune response has been studied also in the E2 protein DNA vaccination experiments. T-cell proliferation assay gave clearly negative results. Simultaneous expression of other antigens from the same plasmid (HIV1 Nef protein) at the same time showed strong induction of antigen-specific humoral and cellular immune response (our unpublished results). Additional support for low immunogenecity of E1 and E2 proteins comes from the fact that latent infection of humans and animals with papillomaviruses is quite common. In the case of strong immunosuppression caused by e.g. cancer chemotherapy or by the HIV1 infection induces fast appearance of warts in these patients. The BPV-1 based expression vector p3.7LDL constructed by us harbours the 2.6 kb human low-density lipoprotein (hLDLR) cDNA fragment. After transfection of the construct to the LDLR-deficient cell line CHO-ldlA7 the cells produced hLDLR mRNA and expressed the hLDLR protein during a 32-week period of observation. This is considerably longer time range than with the popular adenoviral vector systems (approximately 4–6 days). 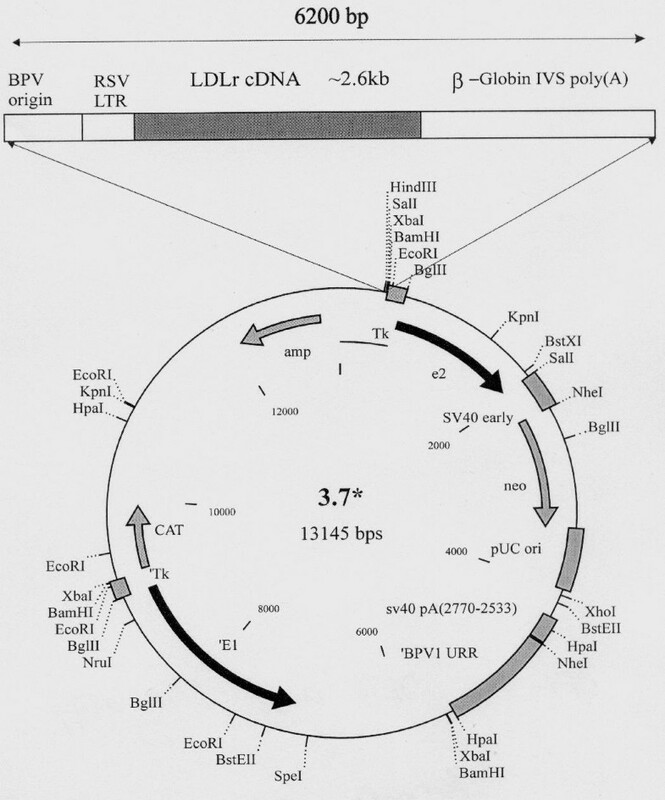 The long-term episomal maintenance of the bovine papillomavirus type-1 plasmids has been documented earlier (18). The transfected cells were able to internalise DiI-labelled LDL particles as judged by the internalisation assay. The transfection efficiency with the CHOldlA7 cell line was 1–5%. It has been shown in the animal model system that an 2–4% increase in the LDLR expression results in 20–30% decrease in the serum cholesterol (23). Further in vivo experiments with the vector (we do not plan to use viral constructs) should demonstrate whether the transfection efficiency obtained by us is sufficient in terms of physiological and clinical effects. Bovine papillomavirus type-1 (BPV-1)-derived vectors could be suitable for gene therapy due to their episomal maintenance at intermediate to high copy number and stable, high-level expression of the gene products. We constructed the BPV-1 based vector p3.7LDL harboring the human low-density lipoprotein receptor (LDLR) gene cDNA. The construct produced functionally active LDL receptors in the LDLR-deficient cell line CHO-ldlA7 during the 32-week period of observation. In vivo experiments should reveal, whether the 1–5% transfection efficiency obtained in the current work is sufficient to bring about detectable and clinically significant lowering of the amount of circulating LDL cholesterol particles. A plasmid pLDLR-3 (generously provided by Dr. K. Kontula, Helsinki University) containing the whole hLDLR cDNA was cut with XbaI/XhoI and a 2.6 kb fragment containing the hLDLR cDNA without its 3'-untranslated region was isolated. This fragment was cloned into pUE83(Xba-) to introduce BPV-1 origin and RSV LTR upstreamof the ATG codon of the hLDLR cDNA and β-globin poly(A) signal to the 3' end of the hLDLR cDNA. The HindIII fragment of this construct was cloned into an expression vector p3.7 containing BPV-1 URR, E1, E2 and the neomycine gene for selection. The construct was called p3.7LDL. CHO cells were electroporated with 1, 2 and 5 μg of the empty self-replicating vector TK3.7 and the p3.7LDL. Low-molecular weight DNA was harvested 72 hours post-transfection and digested with DpnI and the linearising enzyme Bpu1102I. Corresponding marker DNAs (200 pg) were linearised with Bpu1102I. Fragments were analysed by Southern blotting. The hybridisation probe was a BPV-1 replication origin fragment. Chinese hamster ovary (CHO) ldlA7 cells were used as the LDLR-deficient cell line. The cells were cultured in F12 medium with 10% fetal calf serum at 37°C in 5% CO2. 2.5 and 10 μg of the p3.7LDL was electroporated into 70–80% confluent plate of CHO-ldlA7 cells at 230 V, using an electroporation apparatus (Bio-Rad) at the capacitance setting 960 μF. Twenty-four hours after transfection, G418 (500 μg/ml) was added to the medium for selection. Five single colonies were picked in 12 days and analysed for presence of the cloned sequence. DNA manipulations were performed essentially as described by Sambrook et al. . Presence of the p3.7LDL in transfected CHO-ldlA7 cells was verified by PCR and Southern blot analysis. Native (non-transfected) CHO-ldlA7 cells were used for control. Primer pairs used in PCR: 3' end (ex17F-GAGGAGCAGCAGAAGGAAAGGG; ex17R-GGCAAATGTGGACCTCATCC); RSV LTR region/5' end (RSV5'LTR-GCCTAGCTCGATACAATAAACGCC; ex3R-CGACAGCCTTGCTCGTCTG). In the Southern blot analysis, 20 μg of DNA isolated from 1 native and 5 transfected CHOldlA7 cell clones was cut with Bpu1102I. The Bpu1102I-linearized p3.7LDL was used as the hybridisation probe. The same linear vector was used as a control probe on the gel. Total cellular RNA was isolated from native and transfected CHO-ldlA7 cells with RNAzol™ B (WAK-Chemie Medical). 20 μg of total cellular RNA was blotted onto nylon transfer membrane (Hybond-N+) and hybridised with the [32P]-labelled PCR product (exon 13–15) from the hLDLR. In the RT-PCR, the 3' reverse primer (ex17R) was used to synthesise the LDLR cDNA from 5 μg of total DNase-treated cellular RNA and a 200 bp region from the hLDLR gene was amplified. Negative controls for the cDNA synthesis (without RNA) and the PCR (reaction without cDNA) were included in the assay. Transfected and native CHO-ldlA7 cells, grown in coverslip bottom dishes were washed with PBS, fixed in methanol for 5 min (-20°C), permeabilised with 0.1% Triton X-100, blocked in 1.5% dry milk in PBS-0.1%-Tween 20 and incubated separately with antibodies for one hour at 37°C. Supernatant of IgG2b monoclonal antibody (CRL-1691, ATCC) against hLDLR was used as primary and anti-sheep FITC conjugated (Sigma) as secondary antibody. Between every step, the coverslips were washed with PBS-0.1%-Tween 20. Samples were treated with SlowFade™ Light Antifade reagent (Molecular Probes) and then viewed under a fluorescence microscope (Olympus AH-2). Transfected and native CHO-ldlA7 cells grown in coverslip bottom dishes were incubated in F12 medium containing 10 μg/ml DiI-LDL particles (Molecular Probes) at 37°C for 3 hours. At the end of incubation, cells were washed three times with PBS and fixed in 2% formaldehyde in PBS for 2 minutes. After fixation, cells were washed and placed in PBS for viewing. Fluorescence images were obtained using a microscope (Olympus AH-2) with a filter set for DiI (excitation 555 nm, emission 571 nm). Metaphase spreads from transfected and native CHO-ldlA7 cells were prepared by standard protocols. The cells were synchronised in the medium containing 5-bromodeoxyuridine (200 μg/ml) and released by adding thymidine (0.3 μg/ml). FISH was performed with biotin-16-dUTP probes by nick translation (Biotin-nick translation mix, Boehringer Mannheim). The hybridisation mixture contained 20 ng of the labelled probe with 10-fold excess of herring sperm DNA in 50% formamide/10% dextran sulfate/2×SSC. Detection of the hybridised probe was performed using avidin-FITC and amplified once with additional layers of biotinylated goat antiavidin (both Vector Laboratories) and avidin-FITC. 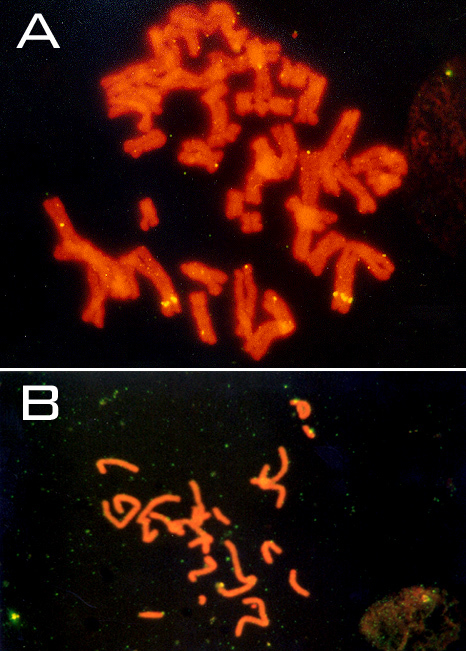 DNA was counterstained with 1 μg/ml propidium iodide and stained with 3 μg/ml DAPI (4'-6'-diamidino-2-phenylindole). Slides were mounted in antifade medium (Vectashield Vector) and examined with Olympus AH-2 microscope. This work was supported by grant #2967 from the Estonian Science Foundation and Estonian target financed project "Human Genome – Isolation, structure, function and diagnostics of human genes" #0180518s98. We thank Dr. Maris Laan for her help and advice with FISH and Dr. Illar Pata for critical reading of the manuscript.